On June 27, 1969 a police raid on a Greenwich Village gay bar called the Stonewall took a surprising turn when patrons decided it was time to fight back. As a riot erupted on Christopher Street, a new era in the Gay Rights Movement was born. Vito Russo, a 23-year-old film student, was among the crowd. Over the next twenty years until his death from AIDS in 1990, Vito would go on to become one of the most outspoken and inspiring activists in the GLBT community’s fight for equal rights. He was a pivotal part of three well-known organizations during their formative years: the GAA (Gay Activists Alliance), which staged subversive works of protest performance art to secure rights and dignity for all gay people; GLAAD (Gay & Lesbian Alliance Against Defamation), formed to ensure that media representation of gays and lesbians was accurate; and ACT UP (The AIDS Coalition To Unleash Power), a guerrilla activist group that turned the fury over President Reagan’s refusal to do anything about AIDS into a series of highly telegenic acts of civil disobedience. In the midst of his commitment to activism, Vito was also a prolific writer. His seminal book The Celluloid Closet explored the ways in which gays and lesbians were portrayed on film, what lessons those characters taught gay and straight audiences, and how those negative images were at the root of society’s homophobia. 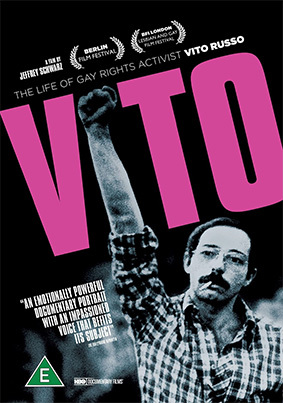 Even before the book was published, Vito was taking The Celluloid Closet on the road, traveling to gay film festivals and college campuses for an entertaining and informative lecture-slash-clip show that intertwined Vito’s love of show business and radical gay politics. He continued writing, lecturing, speaking out and acting up until just months before his death. Vito is a documentary about the man who brought us all out of the Celluloid Closet. Vito Russo changed the face of queer film theory forever. Now, director, Jeffrey Schwarz looks back at the man and the ways in which LGBT representation has changed over time. Vito will be released on UK DVD on 25th March 2013 by Peccadillo Pictures at the RRP of £15.99.